One of the most beloved stories of all time—The Hockey Sweater —is celebrated in this heartfelt recollection. Reflecting on the original short story and mortifying real-life moment that started it all, This Sweater Is for You! relates how the resulting film is as much about childhood emotions and the desire to fit in as it is about hockey, the clash of cultures, and a harkening to bygone times. 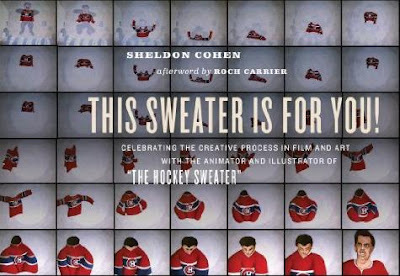 Canada’s tireless devotion to the film is illustrated, emphasizing how it is also loved by many more around the world. Delving into the artist’s notebooks, photographs, and memories, this record recreates the movie’s entire development, journeying back to the people and places that inspired its original imagery. The director’s additional films and illustrations are also explored, chronicling a 40-year career and providing rich insights into the creative process. Sheldon Cohen is an award-winning animator and film director, an illustrator, and a painter. His films include I Want a Dog, Pies, The Snow Cat, The Sweater, and The Three Wishes. He is the author of The Basketball Player, The Boxing Champion, The Flying Canoe, and The Longest Home Run. He has lectured at Harvard University and Concordia University. He lives in Montreal, Quebec. Roch Carrier was Canada’s National Librarian and the author of several Canadian classics for both adults and children. He has been awarded the Stephen Leacock Award for Humor, Fellow of the Royal Society of Canada, Officer of the Order of Canada, and several honorary doctorates. He lives in Ottawa, Ontario.